Similar to tofu, tempeh is made from soybeans, and packed with complete protein. However, unlike tofu, tempeh is made by fermenting whole soybeans, which makes it easier to digest and a great source of fiber. We recommend trying this recipe on an open-faced sandwich with spicy arugula and honey mustard, or try it with dinner alongside sauteed greens and roasted vegetables. 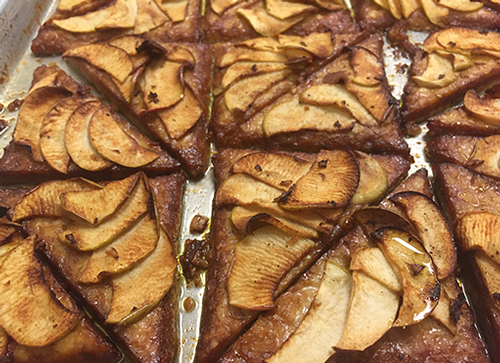 Arrange tempeh on a baking sheet in a single layer and top with overlapping apple slices. In a medium bowl, whisk together juice, ginger, oil, vinegar, soy sauce, honey, cumin, and pepper, then pour mixture over tempeh and apples. Bake until most of the liquid is evaporated, tempeh is golden brown and apples are softened, 40-45 minutes.